It's reported that the restructuring of Ferrari that follows the 'retirement' of Ross Brawn, and Paolo Martinelli's move to FIAT, has left technical manager Nigel Stepney feeling unhappy and dissatisfied, with the Englishman said to be seeking a fresh challenge with a new team. Speaking to Pitpass on Thursday evening however, Ferrari spokesman Luca Colajanni was quite clear on the matter; "Nigel has a contract up to the end of the season 2007," he said, "and this remains valid". 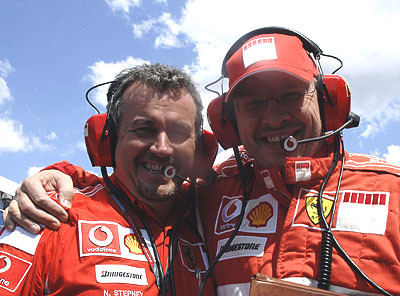 Having joined Ferrari in 1993, as chief mechanic, and progressed to the role of race & test technical manager, Stepney has played a key part of the Italian outfit's golden era. Following the retirement of Michael Schumacher many believe that Ferrari's reign was coming to an end, especially with other key figures such as Brawn, Byrne and Todt coming towards the ends of their careers. Then again, many believe that Ferrari has much of the structure in place for a new era, and that Brawn will return to play his part. Having been in F1 since 1979, when he was a member of the Shadow team, Stepney has spent almost half of that time with the Maranello outfit. Whether he will stay on board in the hope of being part of the new order or whether he will seek a fresh challenge elsewhere, remains to be seen. However, for now Ferrari is adamant that he's going nowhere.